(NewsUSA) - For many parents, it's a struggle to get kids to read outside of the classroom, but November is the perfect time to change that, because it's National Family Literacy Month. The importance of reading goes well beyond acing a test or getting an "A" on a book report. It's a lifelong skill that helps you to better understand the world around you and even yourself. And it's becoming increasingly important to ensure that kids don't become non-readers in their busy, over-connected daily lives. "Reading opens up so many possibilities, from discovering a new interest to sparking untapped creativity. Best of all, it is a great way to spend time together as a family," says Emily Levitt, vice president of Education for Sylvan Learning. Here are a few suggestions to help kids to fall in love with reading, and to share fun, memorable reading experiences together as a family. * Read Aloud -- The easiest way to get kids interested in reading and to build their vocabulary is for parents to read aloud to their children, no matter their ages. 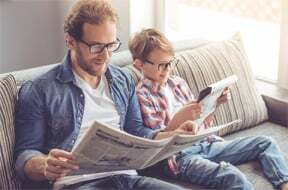 Kids will often skip over words they don't recognize when reading alone, but if they hear their parents say the word, they may ask for the definition. Putting aside just 15 minutes a week to read aloud to kids can make a difference. * Start a Book Club -- Starting a book club with a group of your kid's friends and their parents is a great way to make reading fun. Give participants a month to read the selected book, then organize a party where everyone can chat and enjoy themed snacks. * Stick with What They Like -- Kids will be more inclined to read if it's about something they're already interested in. And if you can share that interest with them, that's even better! And because not everyone loves the same subjects or genres, try to at least hook them with engaging books on whatever they enjoy -- be it baseball, magic or anything else. * Monkey See, Monkey Do -- It's important that kids see their parents reading. If they don't, it's an unspoken statement to your child that it's okay not to read. From crossword puzzles to comic books, it's easier than you think to build literacy as a family. Make a conscious effort to set time aside time for you and your kids to read together. * Deploy Backup -- Not every child is a natural born reader and even kids who are great readers can use reading help. Sylvan Learning offers reading programs from Pre-K through Grade 12. And because no two children are exactly alike, they personalize reading tutoring for each child, giving kids the personal attention and confidence they need to thrive. For more information, please visit www.sylvanlearning.com.